There is a growing concern about air travel and it's impact on the environment. In 2017 the International Civil Aviation Organization (ICAO) documented a record-breaking 4.1 billion people waiting in line to check-in, go through security, shuffle on board a plane and take to the skies. This compares to just a few million passengers in the 1950s. We are flying more frequently than ever before and taking more long-haul trips. With cargo flights also added into the mix, it is easy to see why there is growing concern about the aviation industry’s increasing impact on the environment. 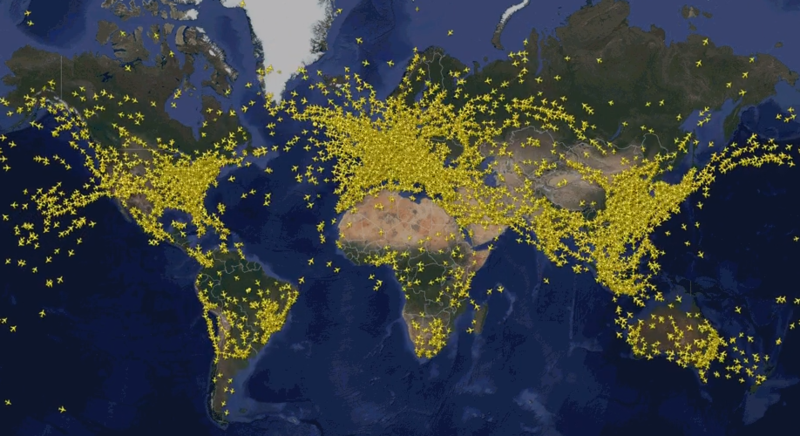 Aviation app and website FlightRadar24 tracks the flow of air traffic around the globe. Like ants marching across the screen, the service uses tiny plane icons to show real-time flight paths around the world. In March 2018, the site recorded its busiest day of air travel since it launched back in 2007, logging 202,157 commercial, cargo and personal flights in a single day. This is equivalent to 140 planes taking off every minute somewhere around the globe. According to FlightRadar24, weekdays tend to be busier than weekends and the figures for June showed that Fridays usually saw the most traffic. A tweet revealed that the busiest day of the year usually occurs during the last week in August, as passengers in the US and Europe take their final opportunity to get away on vacation before the new school year begins. The boom in air travel goes hand in hand with the growth of globalization, increased communications and mass tourism. At the click of a button products can be ordered from the other side of the world and delivered in a week, or even a day or two. As global economies become more connected, air cargo has increased – ICAO figures showed freight traffic grew by 9.5% in 2017. A study on the environmental impact of the tourism industry collected data from 160 countries to estimate the sector’s true carbon footprint. The findings indicate that our habit of jetting off on holiday may be doing more harm to the planet than previously estimated. Between 2009 and 2013 the industry’s carbon footprint jumped from 3.9 to 4.5 gigatonnes of equivalent carbon dioxide each year. This figure represents about 8% of total global greenhouse gas emissions and is four times greater than previous estimates of 2-3%. The study takes into account the direct impact of holiday flights, ground transfers and hotels, but goes further to include emissions from other factors related to tourism such as shopping, eating out and getting around. Researchers concluded that global demand for tourism is outgrowing the industry’s efforts to go green, meaning that unless we drastically change our habits, emissions from flying look set to keep increasing in the future.